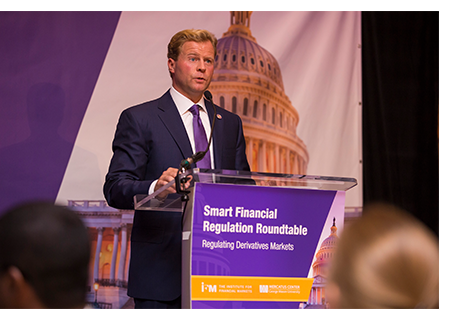 Commissioner Brian D. Quintenz was the keynote speaker at our recent roundtable on smart financial regulation. The event co-hosted by the IFM and The Mercatus Center at George Mason University attracted regulators, policymakers, market participants and scholars to discuss how a principled approach to regulation, supported by economic analysis and effective enforcement, sustains a safe, liquid and innovative financial marketplace. During his address, Mr. Quintenz discussed his desire to move the agency away from "one-size-fits-all" regulatory policies and towards ones that focus on more narrowly defined risks borne by specific market participants.